Earlier this week, an infamous Super Mario 64 trick discovered last year was finally accomplished on actual N64 hardware with the help of a bot that worked for over thirteen hours. At the time, the trick was theoretical: attempting it on a console would crash the game. It required traveling a certain way through the level. This path only worked in an emulator. A new route has allowed a bot to finally complete it. The A button challenge, as some of you know, is a self imposed gameplay restriction that tries to complete the game pressing the A button as little as possible. It means that Mario can’t jump as often as normal. How does he get the star if he can’t jump? The answer is speed. Tons of speed. Using a special spot on the map, he traps Mario under a gate to build up movement speed for over thirteen hours. After that, he darts around the map from point to point until he zips onto a cute enemy scuttlebug that has been manipulated to a position that can give the boost necessary to bounce Mario to the star. Mario’s position on the map is determined by an approximate value that may not actually reflect where Mario is actually standing. 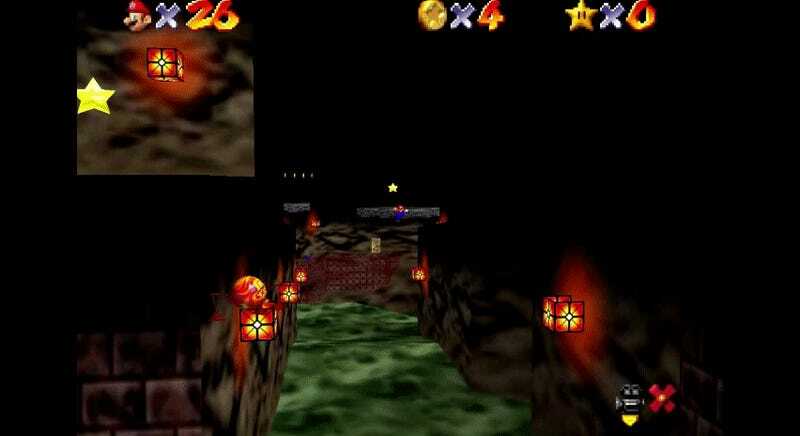 The result is that Mario can escape the map and break into what Buchanan calls a “parallel universe.” In a parallel universe, Mario is technically outside of bounds but the game still tracks his position on the map’s floor. Essentially, he’s actually in one place while the game detects him moving in another. After some time, the two values sync up and Mario can return to the map while jumping to a new spot on the floor. This means that the trick is now “console verified,” a term that tool assisted speedrunners and hackers use to confirm that their glitches and runs are finally working outside of an emulator. In theory, this means a human being could sit down for over thirteen hours to perform the trick and grab the star. In practice, that will be left to bots and computers. The whole thing is a remarkable showing of dedication from hackers that highlights how complicated and awesome games are. Thanks for the boost, scuttlebug.